Why Use Manuka Honey on Eczema? Manuka honey is raw honey, so not pasteurized at high temperatures and thus killing all the medicinal properties. It is made from pollen extracted from the Manuka flower which contains the enzyme Methylglyoxal. 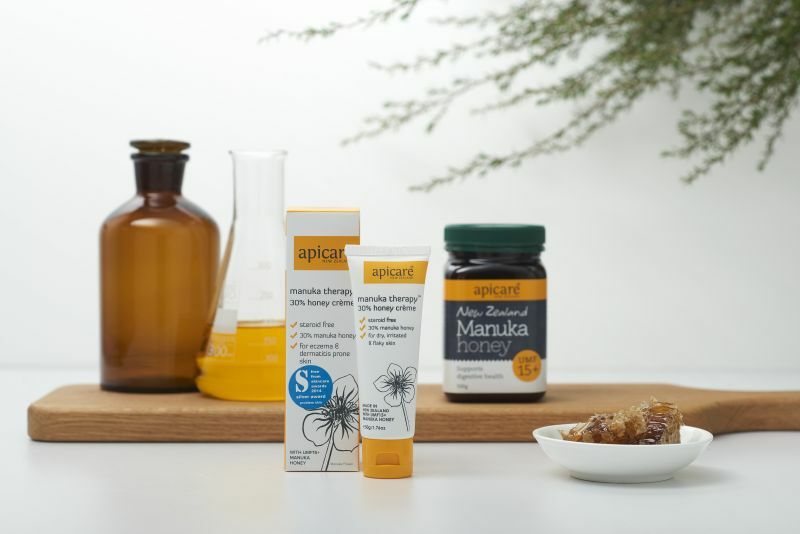 This enzyme is unique to Manuka honey and provides a high level of peroxide anti-bacterial properties, making it much more powerful for healing than traditional honey; there are also additional anti-bacterial properties found in Manuka that can specifically combat staph and other topical infections that eczema patients are prone to. Dry Skin?/ Sore Hands / Damaged Cuticles? / Cracked Hands / Heels?/Chapped Lips? / Eczema Patches? / Sensitive Skin? All our Apicare products are rich in healing Manuka Honey, plant oils and butters and are individually formulated to really help with dry problem skin, paraben and SLS free.